One would want to have a portfolio of metrics under each heading, constantly improving and changing them. 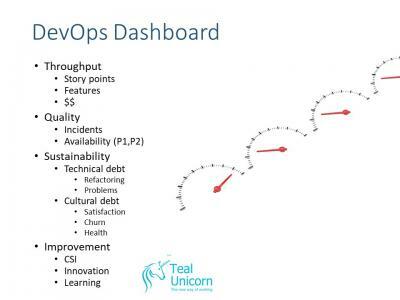 Dashboards are a dynamic activity not a static artefact. Throughput and Quality are lagging indicators of how well we have done at improving work. Sustainability (Tech & Cultural Debt) and Improvement are leading indicators of how well we are going to do at improving work. Balanced Scorecard is about keeping all 4 quadrants advancing. If you push Throughout too hard you may degrade Quality. If you improve Throughput and Quality too hard you may reduce Sustainability by pushing g technical debt or grinding your people, and you may f9rget to Improve. Balanced Scorecard is like an advanced game of Whack-a-Mole.